This all-in-one kit for eyebrows features a soft, pigmented wax to create shape and definition and a setting powder to give brows 12 hours of wear. Brow Zings is perfectly purse-sized and includes a double-ended brush & mini slant tweezers so you can tweeze, shape, fill, and set brows anywhere you go. Soft, pigmented eyebrow shaping wax. Clean up the brow area by plucking stray hairs with the mini slant tweezers. Create shape & definition by applying the soft, pigmented wax to brows with the angled brush. 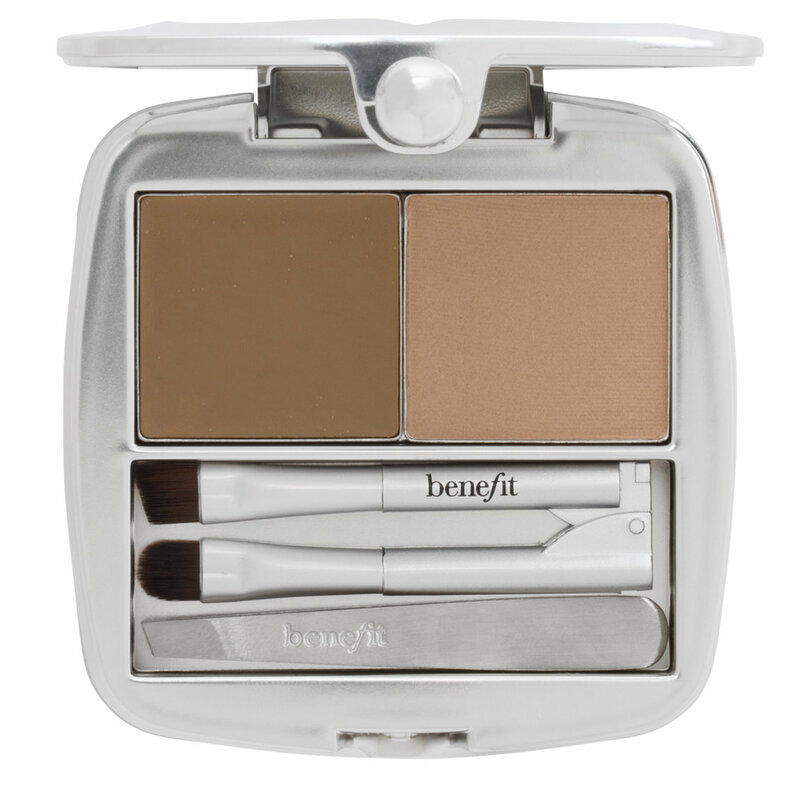 Use the blending brush to apply the setting powder…it fills in sparse areas and locks brows in place for 12 hours! This product really completes your look and I can not leave the house without it!! It really does give your eyebrows that perfect finish. However you can get the exact same compact but from make up range called 'sleek' that is £5.99 compared to this one which is £22 both the exact same finish. But would deffinetly recommend them both. The product in this kit works fine, and comes in three sahdes a light, medium and dark. The only problem is that the dark brown in the dark kit is not dark enough for my skin complexion. I would love to see this product in a black color wax and brow powder. Perfect looking brows in a flesh! At first I was really skeptical with this and thought it would look really fake, like drawn-on brows. But when I applied it, I realised the wax is reeally smooth and its not as dark as it looks, because it adapts to your brow color instantly. the powder just completes the look and I always leave the house with beautiful natural brows. Begore getting this, I used a pencil and an eyeshadow, but never again! This is my fav brow product now, I'm so glad I tried it out. I got this kit for £23.50 and wasn't very sure I'd made the right choice. After a few uses, I got the hang of it and have used it everyday since. It's lasted me nearly 2 years and still looks like I bought it a few months ago. The shade is perfect and the compact brushes are easy to you. The angled brush really helps to get the right shape. Would definitely recommend and would say it was worth every penny. I have been using this since November 2012. It' is absolutely fab. Ideal hard casing makes it easy for my commute - no breakages in my bag! The tweezers aren't fantastic but they can grab the odd long hair - shorter ones - not so great. Long lasting and well pigmented colour. The dark wax is good for taming the odd wild hair and filling in gaps. I use the powder to then shade. I use this every single day! whenever someone says, "I wish I could have your eyebrows" I say "you can, for about $30 at ulta." ;) this product makes my brows so fierce and defined. Filling in my eyebrows is now a MUST thanks to Benefit. I use it to give my brows a little more definition and I couldn't be more happier. I would recommend using a full sized brush instead of the tiny ones they give you. It makes it so much easier to apply. This brow kit is great and it's an essential to my makeup routine. It's great for filling in sparse areas and defining your brows. It includes a small angled brush, a small shading brush, mini-sized tweezers, a brow powder, and a colored brow wax. The only thing in this kit that I don't find myself using is the mini tweezers because I prefer using my Tweezerman. I like that the wax is pigmented instead of clear like some others, as it really helps to define your brows. Sometimes I like to just use the wax on it's own, the color of the wax is a tad bit more natural looking than the powder. All in all, I really like this brow kit but I'm not sure if I will re-purchase when I run out simply because there are others I would like to try that are of a more reasonable price. A friend introduced me to this at first i was weary because i didn't think it would be good.. After lots of nagging i gave up and purchased this item and i LOVE it.. Makes such a difference! I was amazed at how neat my eyebrows looked and because my eyebrows are so thin and fine the product filled those bits up and i now have an overall good look. Don't need that eye pencil for filling in now! ;) Love the cute brushes not too keen on the tweezers though.